Shot Scope Technologies was founded in 2014 and is headquartered in Edinburgh, Scotland. From its inception, the one simple aim of the company has been to improve the way in which both amateur and professional golfers collect and analyze statistics from their game. 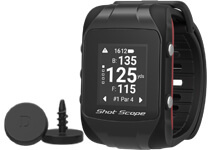 The Shot Scope team, which consists of technology experts and golfers, including a former Walker Cup player, set out to develop smart wearable technology that was more intuitive and comprehensive than any current market offering.